Card Size: 1 15/16" x 2 5/8"
Notes: Checklist incomplete. 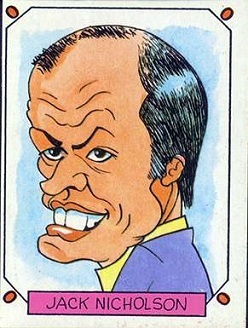 These cards are caricatures of film stars. There was an album that went with this set. Each card is titled "Caricaturas 22." I don't know the significance of the number 22 in this set title. Date info: Charlton Heston's card mentions The Colby's, a TV series that ran from 1985-1987. This set was probably issued sometime in the middle to late 1980s.